There are several economic reports today to affect EURUSD such as Deposit Facility Rate, E-12 Interest Rate and Marginal Lending Facility Rate for Eurozone and ADP Employment Change, Continuing Claims (Wkly), Initial Jobless Claims, EIA Natural Gas Storage Change, DOE Crude Oil Inventories, DOE Distillate Inventories, DOE Gasoline Inventories and DOE Refinery Utilization for the US. As we mentioned in our yesterday analysis, the price had already reached the 61.8 level of Fibonacci retracement and it was time for a rebound. 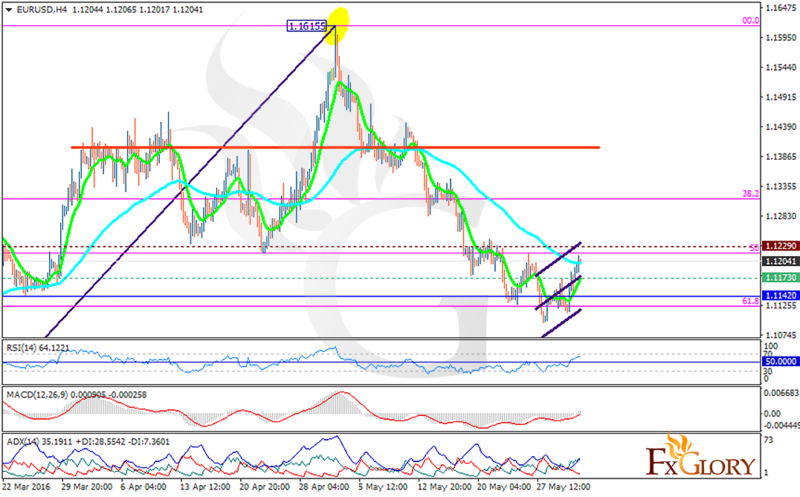 The support lies at 1.11730 with resistance at 1.12290 which both lines are above the weekly pivot point at 1.11420. The EMA of 10 is rallying up towards the EMA of 75 confirming the recent price growth. The active indicators on the chart are all signaling buy opportunity; the MACD indicator is in positive territory, the RSI is above the neutral zone and the ADX is showing strong buyers. The resistance level breakout will push the price towards 1.1250.